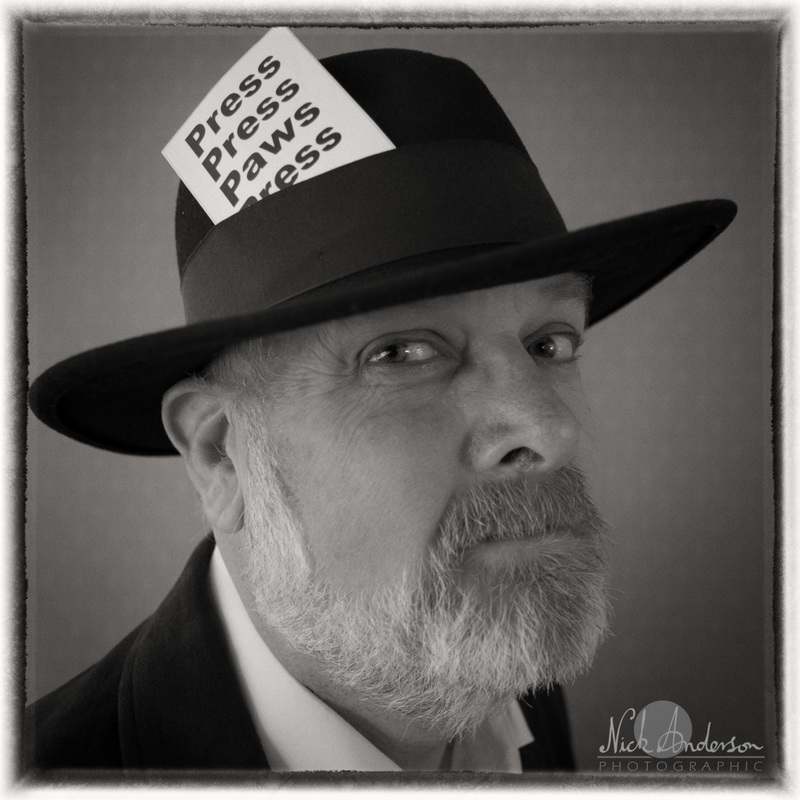 I am busy looking for my old Fedora with the press card sticking out of the hat band as I am off to Crufts with my credentials to see what I fun I can have. This will be my first visit to the world’s best dog show so I am expecting something special. Rather than getting a parade of nearly identical shots of dogs in the ring I am hoping to capture a complete story of behind the scenes primping and pampering, followed by the boredom of waiting for the time to come but topped with the excitement of strutting around in the full glare of the Crufts spotlights! The complete picture! I know plenty of people who will be there and will be making a special effort to get some great images of them but I am sure I will be making some new friends along the way. 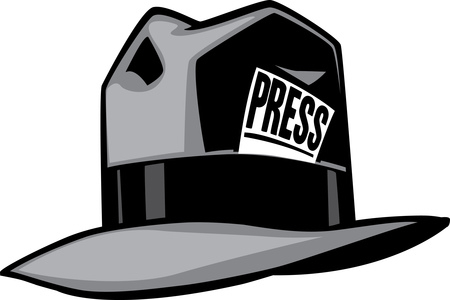 With that in mind I have ordered some new business cards to hand out so that I can attract a bit of interest in the website and try to cover my costs. So here is wishing everyone, especially if they are ginger, all the luck in the world when they get their go at prancing round the show rinks. Don’t forget to wave and I’ll be sure to get the shots you want. 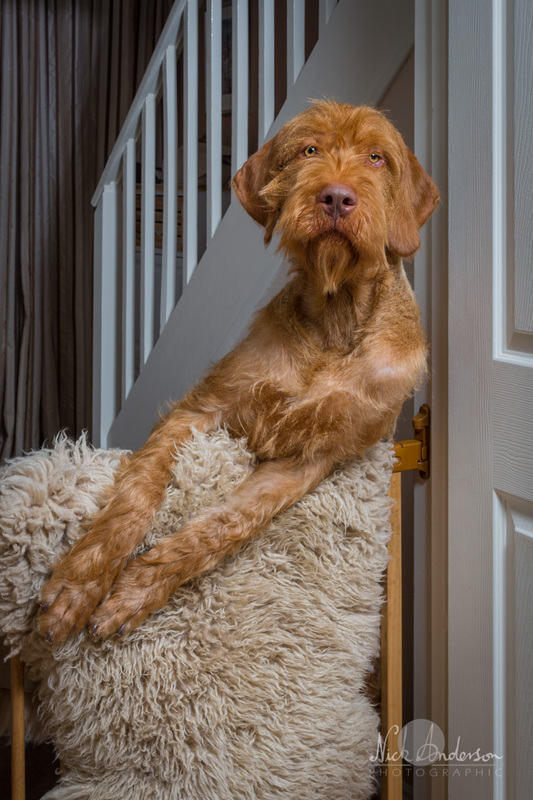 This was a home shoot for Kate who bid for it in a Vizsla charity auction. 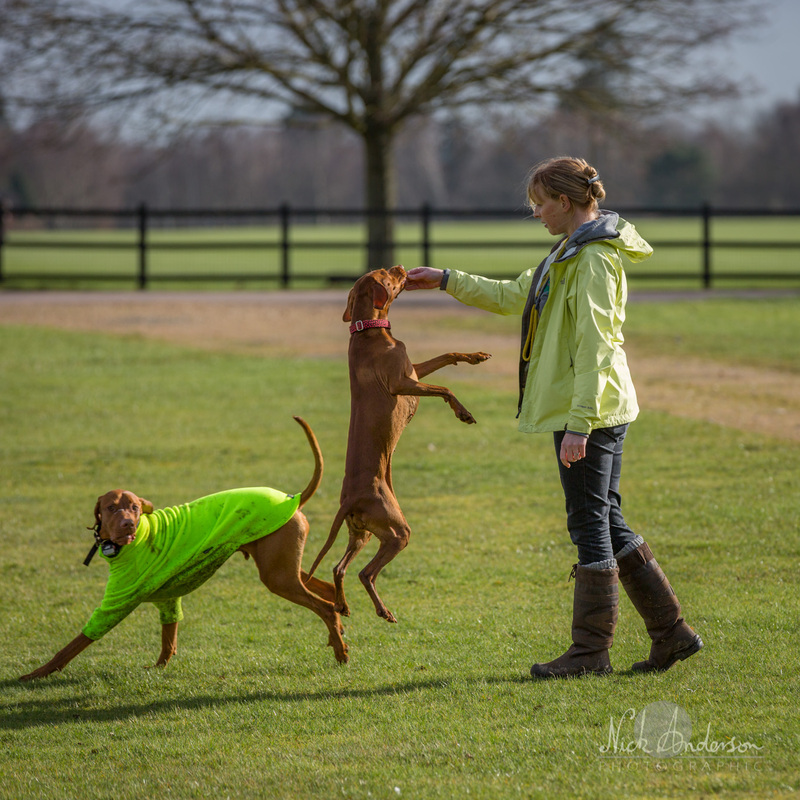 Kate has an interesting family of dogs… two lovely but mature Vizslas, the butch Monty and the delicate Nina. However she added to her pack a little while ago, when helping to rescue two siblings from Cyprus. Having been instrumental in getting them to the UK she fostered them but then decided that they had wormed themselves into her heart and they ended up staying. 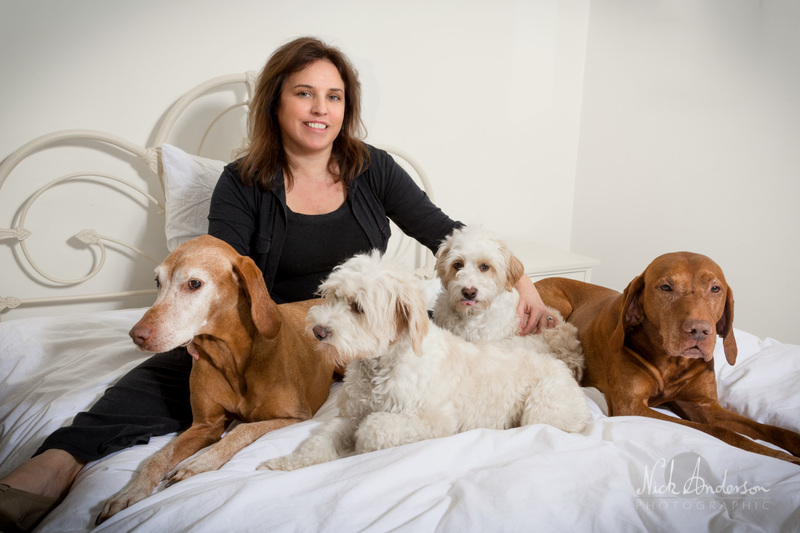 When I met these little furballs I could easily see how Kate succumbed to their charms… they are darlings, playful and full of character so even a large dog breed lover like myself started to weaken! 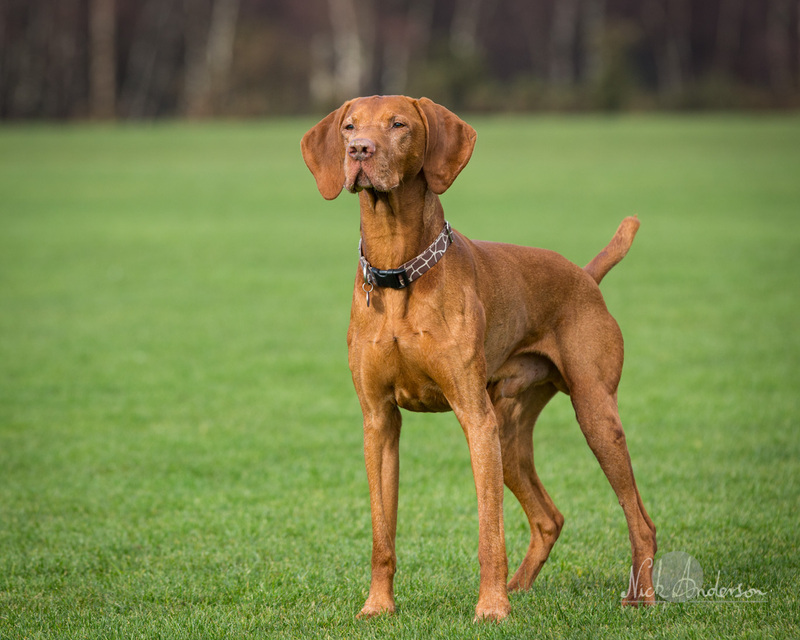 Her Vizslas are both just about into double figures but still sleek and fit. 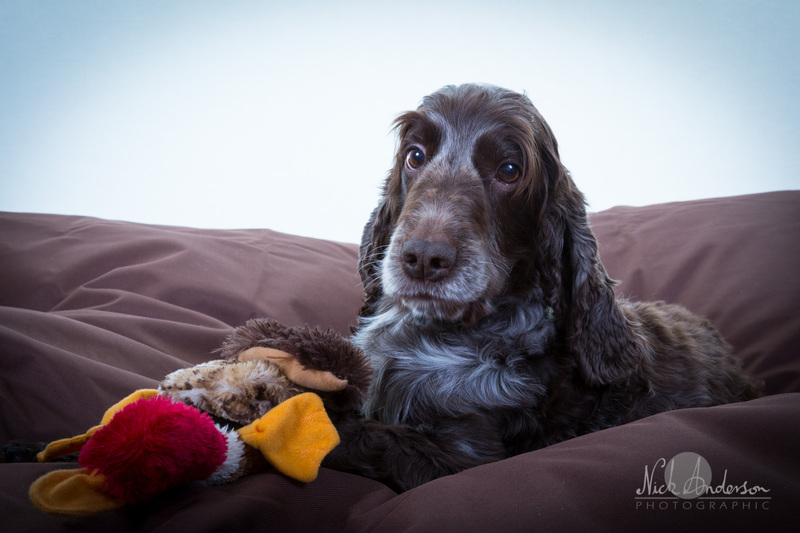 Nina is a real princess who likes her special time with mum on the spare bed and looked quite upset when I managed to get everyone up there for a family shot… I think it will take a while before her nose gets straight again! Monty is a lovely example of the breed and was a successful show dog for a while before Kate decided to give up the glamour of the arena. 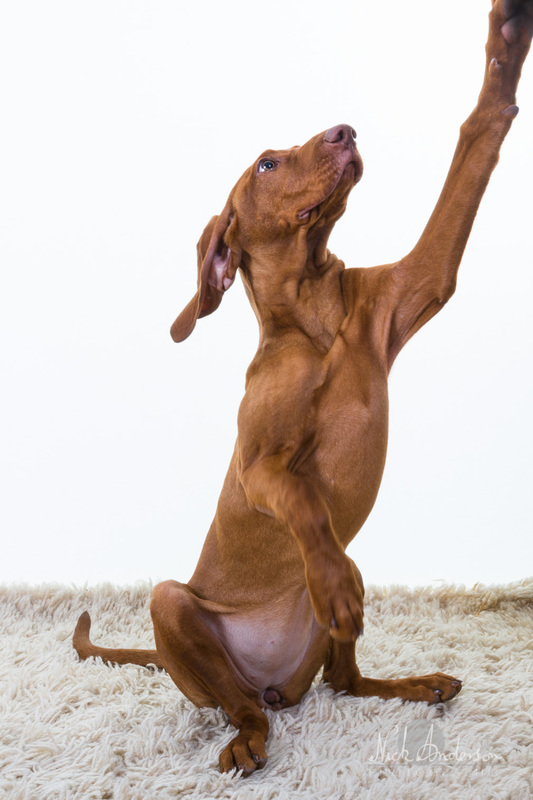 Monty is soft and affectionate and has many of those wonderful velcro habits that Vizsla owners know and love. Then it was into the Windsor Great Park for some outdoor work. 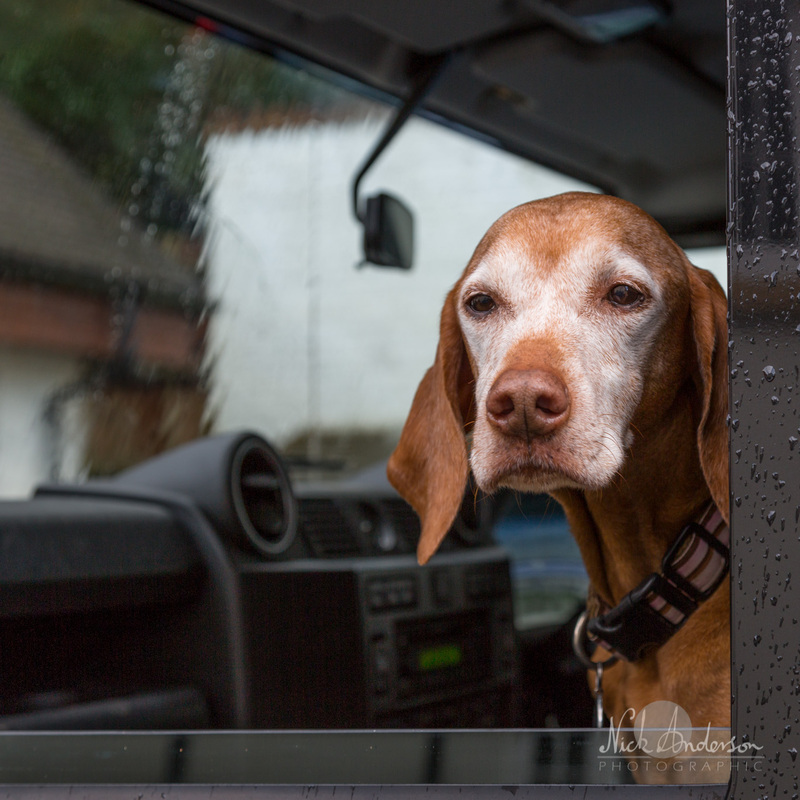 We had worried about the weather but were blessed with a few spells of sunshine which made all the difference, although Nina wasn’t convinced it was ok to get out of the Land Rover! 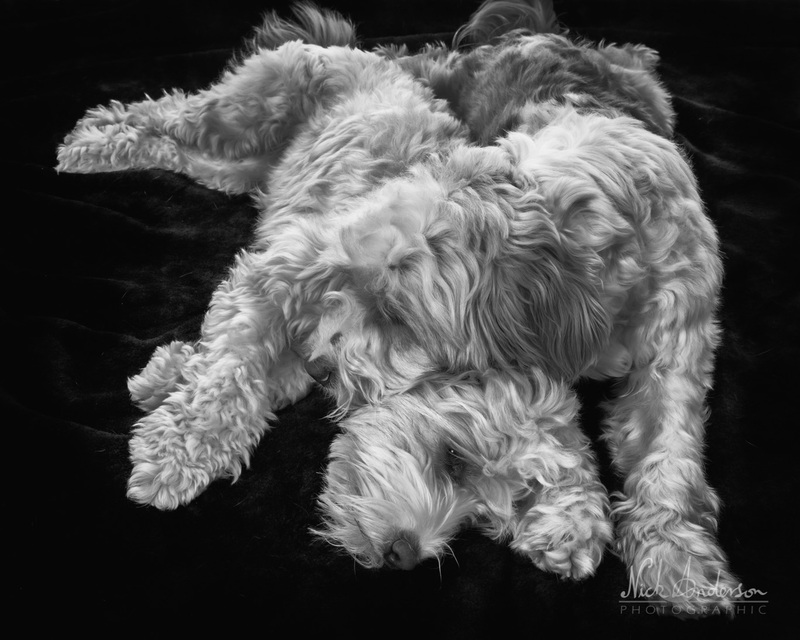 Post processing these shots was a pleasure, even if it took a while putting the finishing touches and I was pleased that I decided to create black and white versions of some of the furball shots… it added an entirely different dimension to their images. 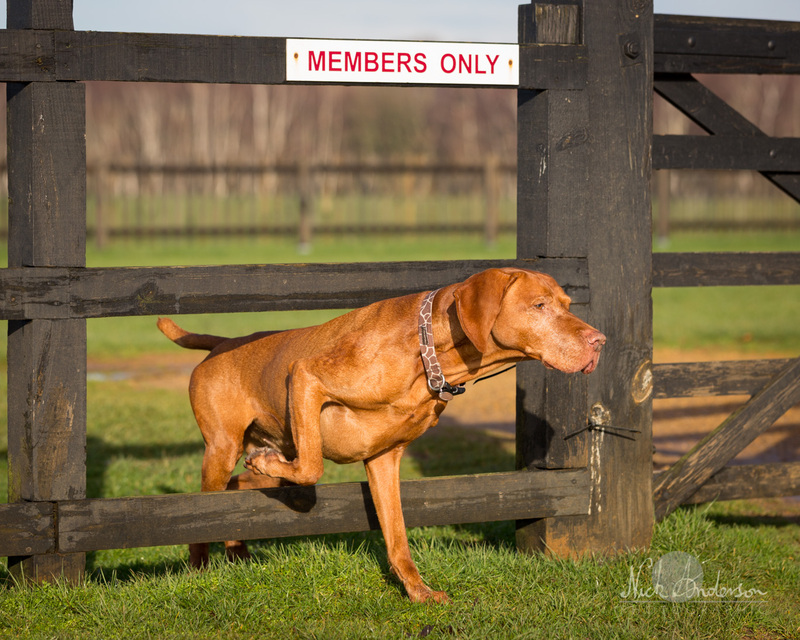 Finally, it was Monty’s idea to invade the Members Only area… I only hope that Kate can get back in next time she visits! If you want to take a look at the whole shoot then click here. That has been a busy few days… hardly time to keep my batteries charged! First was a lovely whizz with Surrey Vizsla to Windsor Great Park which gave plenty of wide open space for the dogs to run in. 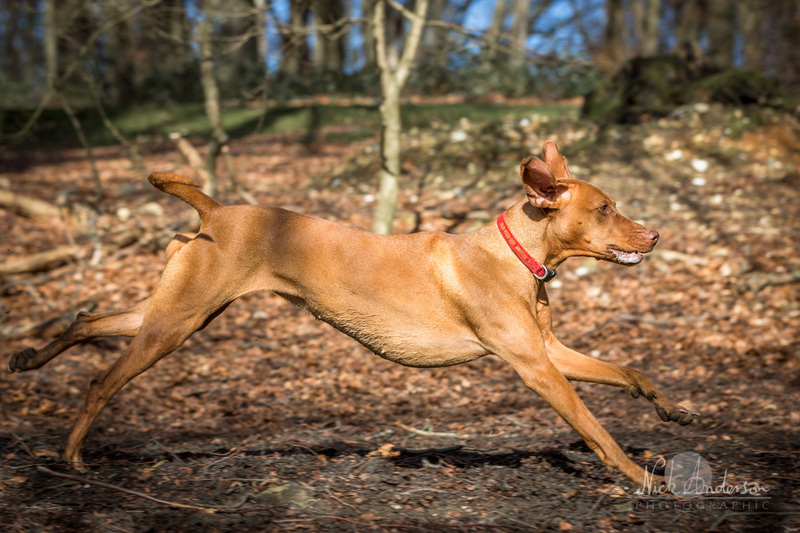 Since the Vizsla is one of the fastest breeds it is great to watch their athleticism, even if it is a difficult job photographing them! The weather started well but things wouldn’t be right unless we had a bit of rain and by the end of the walk we were being blown home by a cold, wet wind that reminded us it was still winter! 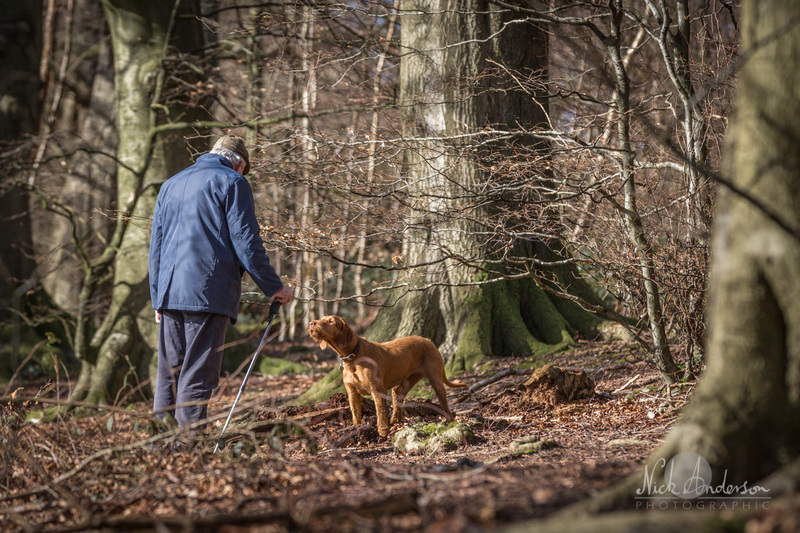 Of course not everyone has Vizslas and we had a few guests along including a very fit German Shorthaired Pointer. If you want to go through the whole gallery of shots for this whizz then please click here. 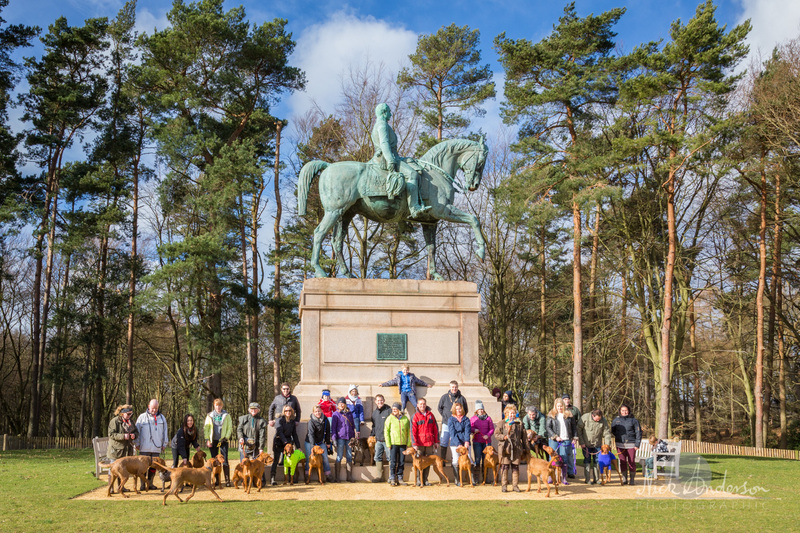 On Sunday it was the turn of the London and Surrey VizWhizz group to get together and it was to Banstead Woods that they turned. That was quite a different environment through wooded paths which were very picturesque, if a bit muddy but the tight space made photography a bit difficult at times. 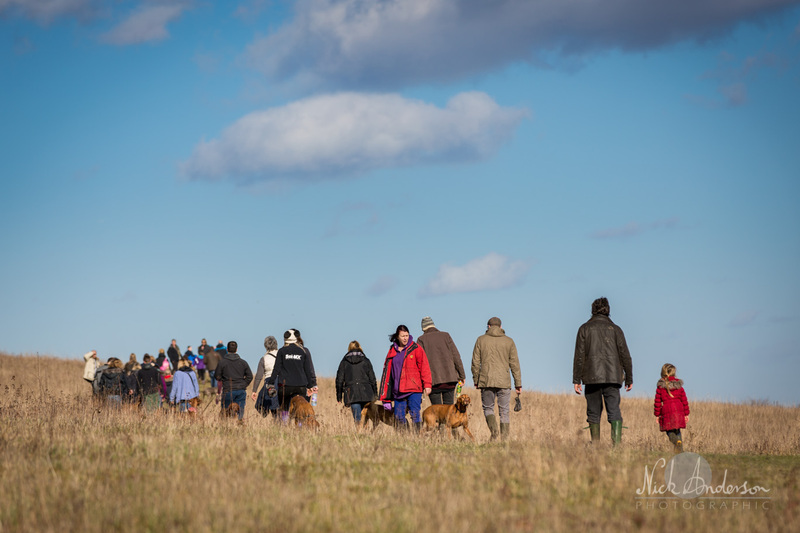 There were plenty of people there with around 40 dogs and it was priceless to see peoples faces as we passed them with our ginger pack of hooligans! I was grateful for the fields we passed through as I was able to get some better running images. I didn’t have much time to work on and post the images from these walks before I was due to do a home shoot for Kate and her delightful pack. 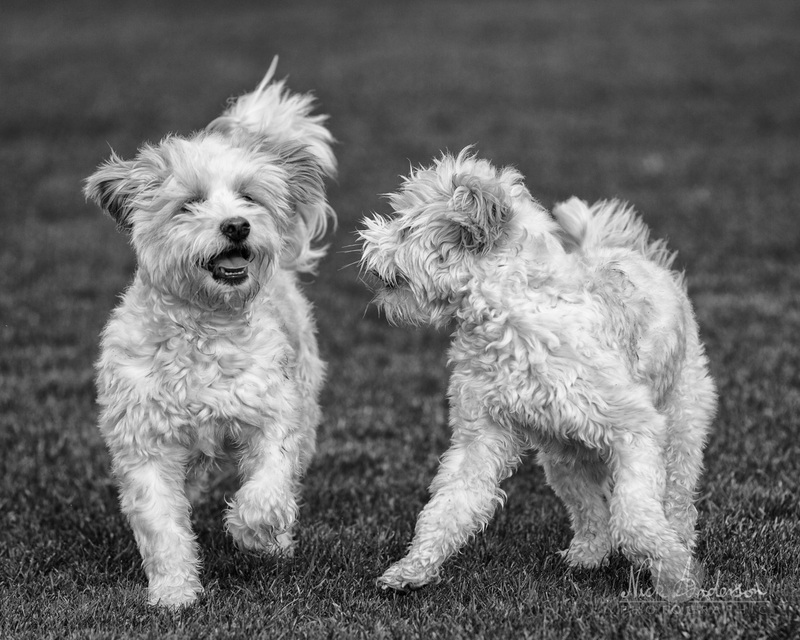 Janet and Tony’s shoot was a little different from normal as I had four adults and three dogs to photograph. This naturally compressed the time I could spend with each combination and reduced the choice of shots that could be attempted. 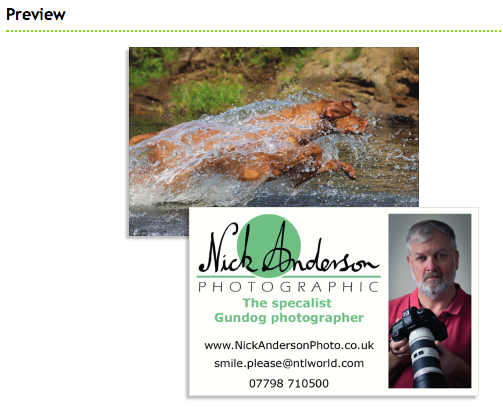 However, I was delighted with the results and they can be found in a gallery on my website. Everyone was wonderfully good natured and the dogs did their best considering the excitement of a visit from Layla, the third dog belonging to Janet’s parents. 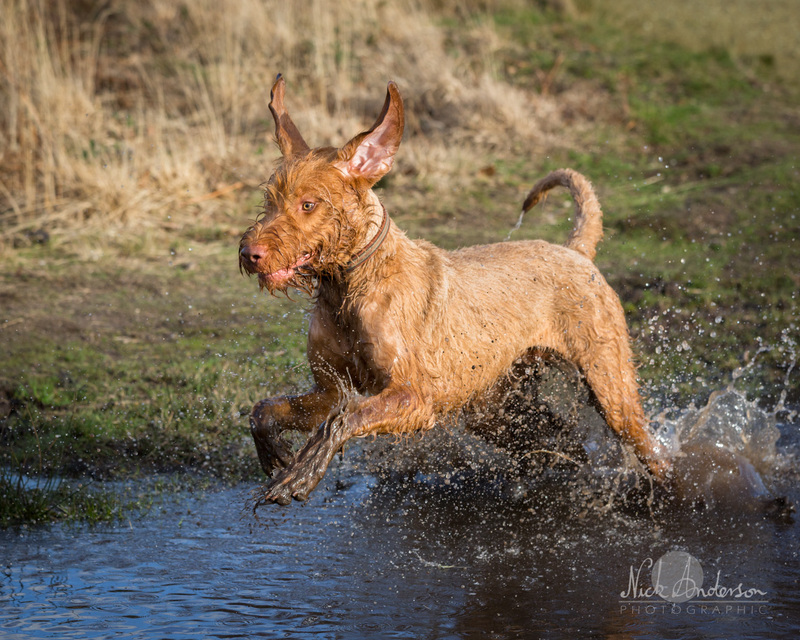 Muttley is a sizeable HW Vizsla and although he is still young and growing he is very laid back and a charming chap, full of character. Janet’s other dog is a mature Cocker who is a rescue dog that has needed lots of love and patience to bring him to the happy state he now enjoys. He has a super coat that mingles black and brown with white streaks and a pair of lovely eyebrows that gives his face such expression. Janet’s parents are the proud owner of a new and squiggly HW Vizsla puppy called Layla. Yet to show much wire, she is sleek and energetic and thoroughly enjoyed games of rough and tumble with Muttley. After the portrait work, our walk took us out into some woods where everyone got to play and produce some great photo opportunities. All told it was a fun shoot and great to be part of. The post processing took a little more effort than normal but Janet was very patient and in only a few days the results were up on the website. Should you want a Home Shoot then please feel free to look through my website and remember that for the month of February I am giving a 30% discount on firm bookings. Off to a shoot tomorrow so time to check and clean the gear to make sure everything is running well and sparkling. My choice of cleaning gear has, for a long time now, been Visible Dust. They have a great selection of sensor swabs and dust brushes which have a fascinating action. The brushes whizz round in the handle to rid them of dust on the hairs and to charge them with static electricity. That helps the dust particles to stick to the brushes as I gently pass them over the sensitive surfaces. Static electricity is a bit of a nightmare for a photographer as the current passing through the sensor generates a charge which naturally attracts dust to the surface. 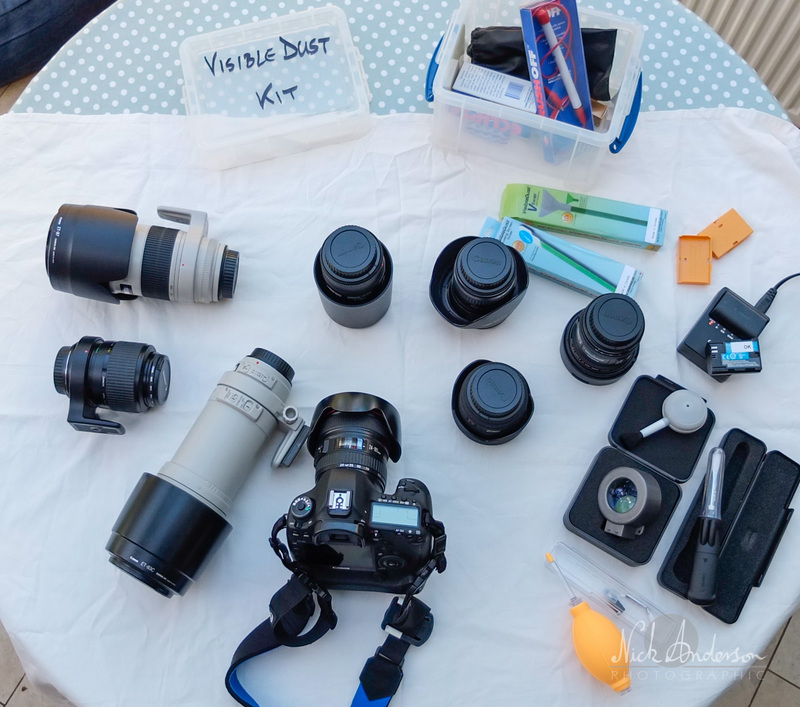 That is why we should always turn off our cameras when we change lenses as well as the usual precautions such as keeping out of the wind and making sure the rear of the lens is dust free before we attach it to the camera. 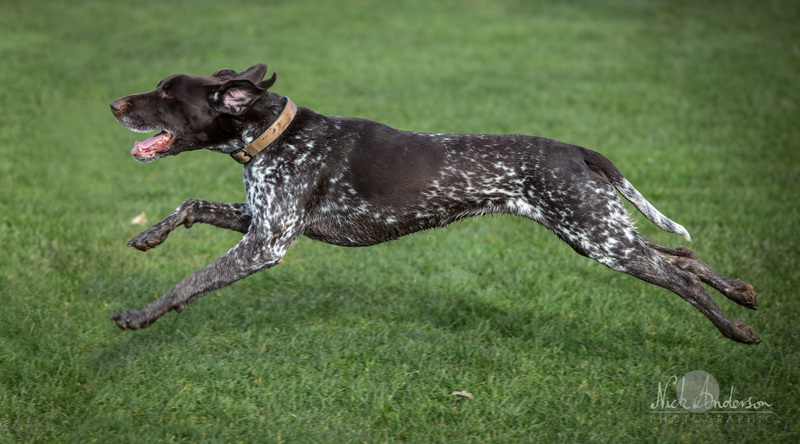 So tomorrow has me off to Janet’s place for a 3 dog shoot, Mutley a lovely HWV, Morgie a super spangle and Layla an HWV puppy who is driving down from Northampton to join us. Should be a great day with some sunshine for our walk in the afternoon. Can’t wait!